Roofings Group currently consists of 2 sister companies; Roofings Limited (Steel & Polypipes divisions) and Roofings Rolling Mills Limited (RRM). Roofings Limited is a privately owned company located on Entebbe Road in Lubowa Estate, 6 km‘s from Kampala city centre. Established in 1994 by Chairman Mr. Sikander Lalani, under license of Uganda Investment Authority (UIA), Roofings commenced operations in December 1995 with an initial investment of $2 million and a labour force of 60 employees. Today, the investment value has reached $95 million, employment stands at 950 and with a market share of approximately 42%; Roofings is by far the leading manufacturer of quality steel and plastic building products in Uganda. Equipped with state of the art machinery sourced primarily from Western Europe, North America and Japan, the company produces a wide range of quality steel products for the construction industry. Roofings has an installed production capacity of 160,000 tons of cold formed steel per annum. The company uses high quality raw materials sourced from Japan and South Africa to manufacture products ranging from steel tubes, roofing sheets and open profiles to nails, barbed wire, chain link and many other materials used in the construction sector. Roofings is the single largest manufacturer of electro−welded tubes in the East and Central African region. Roofings strives to be a one stop shop for all your building materials. To reach this set goal the company has recently ventured into the manufacturing of PVC, HDPE and PPR plastic pipes and fittings. This $5 million plant uses the most modern machinery and is operated by a highly qualified team ensuring total quality realisation. All products are tested and produced in relevance to DIN 8062:1988 and ISO 161/1. For all domestic plumbing, industrial use, water projects, drainage/sewerage management, irrigation, rain water disposal, waste disposal requirements Roofings is now able to serve you at its various sales stations. Roofings Group has three ‘superstores‘ located in Kampala city centre to suit your every convenience and the company has a vast ‘authorised dealer‘ network to make Roofings products easily accessible throughout the country. Today, Roofings Ltd exports close to 25% or 30,000 MT of its products to neighbouring countries; Rwanda, DR Congo, Burundi, Tanzania and Southern Sudan. Export sales have grown from $300,000 in 1997 to $45 million in 2012. The organisation has been presented with multiple awards in appreciation for this remarkable progress in attracting foreign exchange for the development of the Ugandan economy; the Presidential Gold Award for the best exporter of metal products for five consecutive years (2003−2007), and for the first time the Presidential Platinum Award for best overall exporter in 2008. 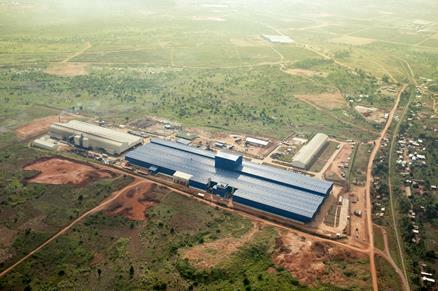 Roofings limited is the only company in the steel sector in East and Central Africa to have achieved International Organisation for Standardization (ISO) 9001, ISO 14001 and OHSAS 18001 simultaneously − Quality Management System, Environmental Management System and Occupational Health and Safety Management System respectively. By developing these international, highly recognised systematic approaches, Roofings Group boasts unrivalled professionalism and strong commitment to the development of society through advanced industrial practices and conserving the environment. Roofings Ltd. aims to maintain, review and continuously improve their quality management systems on a process approach. 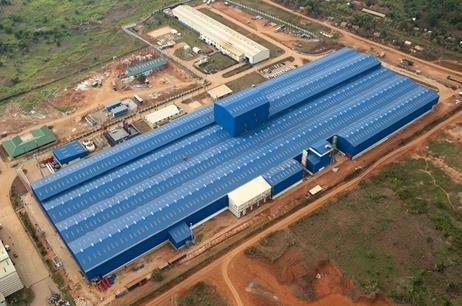 Roofings Group has recently completed its ambitious expansion plan by commissioning RRM limited, a UGX 320 billion mega project which is set to change the face of steel manufacturing in the East African region. This state of the art complex is located in Kampala industrial business park, Namanve. The complex comprises three production units which combined will have a production capacity of 250,000 tons per annum, doubling the group‘s total capacity to produce steel to the tune of 500,000 tons per annum making it the largest in East Africa. 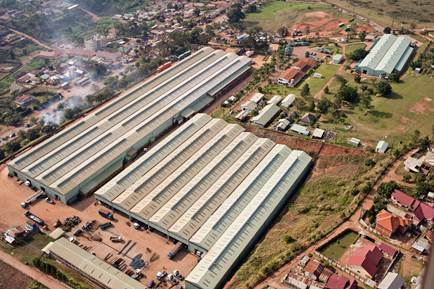 Roofings Rolling Mills− Namanve is a sister company of the well established Roofings Limited in Lubowa. 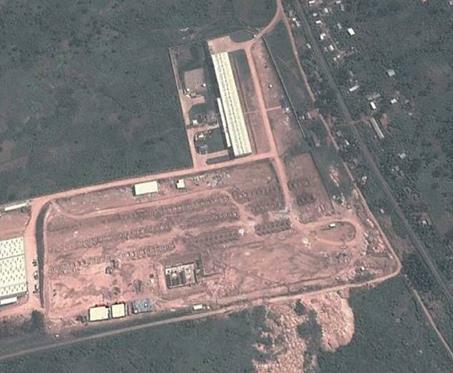 RRM was launched in 2009 with civil construction having started on Phase 1, which is a wire galvanizing plant. Since then both Phase 1 and Phase 2 which makes high tensile re−enforcement bars, have become fully operational. Phase 3 is the largest part of the works and was commissioned in July 2013. In this plant, RRM has acquired technical assistance and equity participation from world renowned Yodogawa steel works (YSW) from Japan. This company has 75 years of experience in the manufacture of galvanized and color coated coils and has been supplying Roofings Limited continuously over the years. The success of Roofings Limited is accredited to the use of world class raw materials, combined with the most modern machinery and trained man power to achieve the best quality output.� Phase 3, through this joint venture will allow Roofings Group to control the quality upstream in order to achieve high quality downstream. As RRM will supply these coils to other sheet forming companies in the region, they are confident to say that the overall standard of metallic roofing sheets will improve substantially with the commissioning of this project. The investment at RRM is $125 million with an installed capacity to produce 250,000 tons per annum. Phase 3, will be a pickling, cold Rolling, Batch Annealing, Galvanizing and color coating plant. The project has been funded partly through private equity (Roofings Limited) combined with financing from a consortium of 6 banks, including international Finance Corporation (IFC) amongst others. As earlier mentioned, Yodogawa Steel Works, A Japanese based steel manufacturer has also participated with Equity. We have worked very hard to become the leader in the Steel sector and it is our pledge to continue to apply professionalism in order to meet the ever growing requirement and expectation from our customers. Roofings Group will continue to grow with Uganda and the region, and we take great pride in being such a strategic partner to strengthen our nation. The company feels strongly that it has an important role to play in developing the standard of living not only for its employees, but for Ugandans as a whole. That is why the company has hosted several health fairs & donated building materials to schools and hospitals. Roofings recently started supplying free of charge oxygen to various hospitals. Within the organisation employees enjoy a safe and clean workplace, fully subsidised suppers & subsidised healthcare. Roofings Group is proud to announce that the development of a new social responsibility initiative is under way. The Forever Forestry initiative is a membership based project that provides people with the opportunities to learn how to live sustainable lives, produce unlimited organic resources, and reclaim damaged landscapes through use of tree planting and techniques which utilize the forces of nature for the benefit of all life. This site, based in Lubowa will include example sustainable farming systems and technologies, a diverse tree nursery for giving out free seedlings, and a presentation and resource centre offering courses, workshops, and seminars on a wide range of sustainability issues.